With a calm, taciturn demeanor that smacks of an old-fashioned movie cowboy, Thomas Montgomery doesn’t seem like the restless type. 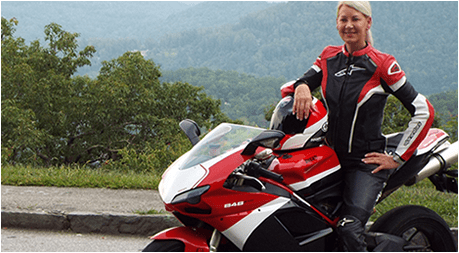 But the owner of Eurosport Asheville, the BMW motorcycle dealership for Western North Carolina, most definitely is. He raced dirt bikes as a kid, studied engineering and architecture in college and then shifted gears into restaurant work, a move that took him to the top of the industry as co-owner of 12 Bones, a barbecue joint that became a favorite of President Barack Obama, along with thousands of other mega-fans. But the days just became too similar, the grind too tedious for Montgomery and his wife, Sabra Kelley. 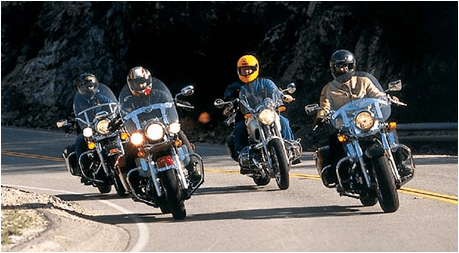 Near the end of their run, Montgomery started looking for an outlet for stress relief – “Something to get out on and go play,” as he says – and decided a street bike would scratch the itch. 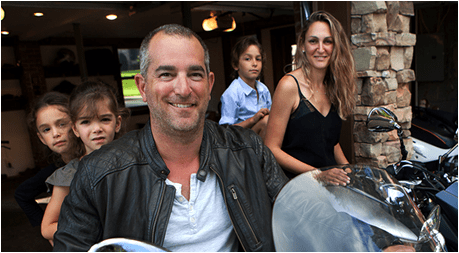 Perusing a BMW motorcycle website, he realized there was no dealership in Asheville, with the closest franchises in Charlotte or Greenville, South Carolina. “It was 20 months from the first contact till I was able to do anything,” he said. But he’s not a guy who’s easily deterred. Montgomery opened the dealership in Biltmore Village in 2011, and he and Kelley sold 12 Bones in 2012, after a seven-year run. Montgomery comes by the motorcycle bug honestly. Growing up in northern Illinois and central Missouri, Montgomery spent a lot of time in his father’s motorcycle dealership, which sold Ossa motorcycles, a Swedish make, and Monarch cycles, a long-defunct brand. Montgomery, 46, began riding competitively around age 10, running races every weekend. “I was going to nationals on a regular basis. I reached the money paying level,” he said, noting that he rode Kawasakis. “I stopped going to school and started working in restaurants,” Montgomery said, adding that he did not always yearn to cook. Like most restaurant workers, he started out washing dishes and bussing tables, but then he had the good fortune to fall in with an incredible chef, Teri Rippeto, in Columbia, Missouri, who told him culinary school was a must if he ever wanted to go anywhere with it. So he enrolled at the New England Culinary School, spending 1996 to 1997 there, with the “ultimate goal” of starting a restaurant. “I actually went into school thinking I would know everything there is to know about cooking,” Montgomery said. While in school, he met Sabra Kelley, and they clicked. A graduate of Cornell University with a degree in environmental engineering, Sabra had lived in Chicago and Denver, working in restaurants and hotels. She also holds a master’s degree in landscape architecture from the University of Colorado-Denver. Montgomery did not suddenly become loquacious in wooing her. They’ve been married 18 years now, so the combination obviously works. In 2001, they both had good jobs in Denver when that itch for change struck. Always handy and restless, they moved to Asheville, bought a house and spent three years fixing it up, selling it for a nice profit. Sitting in a bar one night, Montgomery was drawing on a napkin when the notion of different kind of barbecue joint struck him. “I had the idea, but I wasn’t sure what was available,” Montgomery said. Kelley said they had noticed that Asheville had only a couple of very traditional barbecue joints, and no place offering good ribs. “Then the building came available after the flood,” Montgomery said. That would be the deluge of 2004, which inundated Biltmore Village and the River Arts District of Asheville, including a plain, one-story former diner on Riverside Drive, a stone’s throw from the French Broad River. The flood waters came up about eight feet high inside the building. Undaunted by the 100-year-flood, the couple signed a lease and opened 12 Bones – named for the number of bones in a rack of pork ribs – in December of 2005. They had calculated their break-even mark was 125 meals a day. By that summer they were hitting 300, on their way to 800. “And that was just walk-in,” Montgomery said. That also was before a U.S. Senator from Illinois with presidential aspirations discovered the irresistible allure of the brown sugar and blueberry chipotle ribs, succulent collard greens and corn pudding that could make a grown man weep. In town to prepare for a debate, Obama stayed at the Grove Park Inn. A driver he had, a local, had told him, “You’ve got to go down on the river and get some ribs.” On that trip, Obama dropped in himself. “He was pretty mellow,” Montgomery said. “We were just shooting the (bull) about the restaurant. I asked him what color T-shirt he’d like, and he said, ‘black.’” The future president then paid for a huge takeout order. In 2010, he came back, this time with his wife, Michelle. It was a much more controlled environment, with Secret Service guys milling around in dark suits, earpieces tucked in their ears. Everybody was taking pictures and shaking the new president’s hand. The publicity was priceless, with countless tourists wanting to check out the place Obama had developed a serious jones for. Business boomed even more – and the Montgomery and Kelley decided to sell. While they were only open for lunch five days a week and usually closed after Christmas for a month, the restaurant required someone to be there 24 hours a day when open to start cooking the ribs. They had also opened a second location in Arden, which required a lot of hands-on management. The long hours and constant crush of humanity wore them out. “After a while, I was like, ‘Can I just go somewhere and hang out where I don’t have to talk about the restaurant?’” Kelley said with a laugh. It was time for a change, a big one. Always unflappable, Montgomery allows that the process of opening a dealership “was a little stressful. But it was also a completely different business model, one that heavily relied on computer programs, and lots of spreadsheets and paperwork. “It was a whole different world,” Montgomery said, adding that he had worked under corporate pressure before, so he knew he could handle it. Kelley helped out the new owners of 12 Bones for about a year, but she also had a hand in the Eurosport Asheville, handling the bookkeeping. Sitting in the modern showroom with hundreds of thousands of dollars of motorcycles and gear surrounding him, and nearly a dozen employees who rely on him for their livelihood, Montgomery exudes the calm of an astronaut, with just a dash of mischief thrown in the mix. The pace is a little less harried, but the stakes are just as high. While not approaching the frenetic pace of 12 Bones, business has been strong. Over the course of a year, Eurosport Asheville will sell about 140 new BMW motorcycles, which range in price from $9,000 to $27,000, as well as 70 or so KTM dirt bikes and another 100 used bikes. 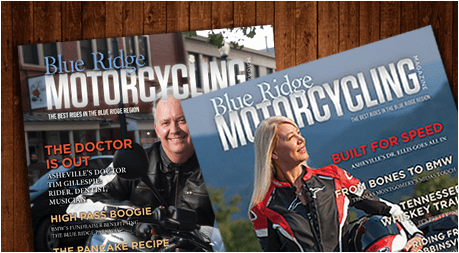 In their business plan, they had anticipated high interest in the mountain region, a biker’s paradise with its gorgeous vistas and twisting roads, as well as a quirky, high-spirited city – Asheville – that’s landed on everyone’s top ten list over the past decade, whether it’s for fine dining or retiring. Just like at 12 Bones, it all goes back to keeping every single customer happy. The dealership just provides more time for engagement, and they make sure they’re fitting the customer with the right bike and gear. General Manager Justin Roberts said Montgomery’s laconic nature and preternatural calm can almost be unnerving at times. But his boss has no interest in intimidating anyone. The customer is king, but Montgomery takes care of his 11 employees and keeps it fun. At its peak, 12 Bones had 36 employees. Kelley says the key to business success is recognizing your own strengths and counting on others to step up with theirs, a trait Montgomery embraces. In short, “you can’t sweat the small stuff,’ Kelley said. Everyone is cross-trained in the business, so each employee can handle every problem that comes up. They all love bikes and want that enthusiasm to be contagious. Thomas Montgomery knows all about staying in touch with that feeling of rightness that comes with riding. This business affords him more time to travel and ride – he spent five weeks last year riding in Canada and the Pacific Northwest, and two weeks in Moab, Utah, riding a BMW 800 GS dual sport and a KTM dirt bike. Peace comes astride a precision machine roaring through the desert, or making the mud fly off road. Kelley rides a Kawasaki dirt bike, and Montgomery jokes that even if there’s a drought she can find a mud hole. While Kelley sticks mostly to trail riding, she says her husband can do it all. Neither has the desire to get back into the restaurant world – at least for now. Montgomery will be the first one to tell you he’s got a good life now, a decidedly saner life. But sometimes he still wakes up with the smell of a grill in his nostrils, and he thinks about cooking again, about the high-energy buzz you get from “getting your asses kicked” in a kitchen, with orders piling up and the adrenaline flowing like beer on tap. “I enjoy cooking more than I have in the past 20 years,” he said. You never know – he might just wake up one morning and feel that itch again.